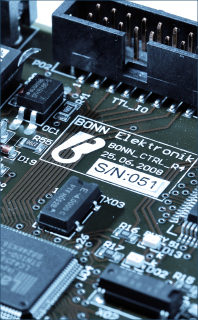 BONN Elektronik was founded in 1975 for production and sales of RF components and systems. Very soon development and production of a wide range of different power amplifiers and RF-systems became the main activity. BONN amplifiers have made their good name with high quality and reliability in worldwide stationary and mobile applications. Resulting from the increasing demand, the company had to build a larger building in 2010. For more than 40 years our aim has been to advise our customers comprehensively in planning and realizing RF- and microwave systems. We are performant and flexible in developing innovative solutions for our customers. Starting from the quotation phase via delivery and installation of the instruments including maintenance we offer a complete service all from one source. Our development and production teams work on the basis of ISO 9001 total quality management. For many years all our instruments already have complied with CE-standards and VDE safety regulations. A complete range of measurement instruments, workstations and machines is supporting our engineers to solve most of the jobs inhouse. Highly committed employees with long experience in RF technology solve complex demands as required by our customers. We are your competent partner and offer “the power you need”. The success of BONN Elektronik in high power RF amplifiers led to the founding of a subsidiary in Budapest in 1991. BONN Hungary Electronics focuses on development and production of components and subsystems for mobile communication as well as customized RF synthesizers and oscillators (see product overview).